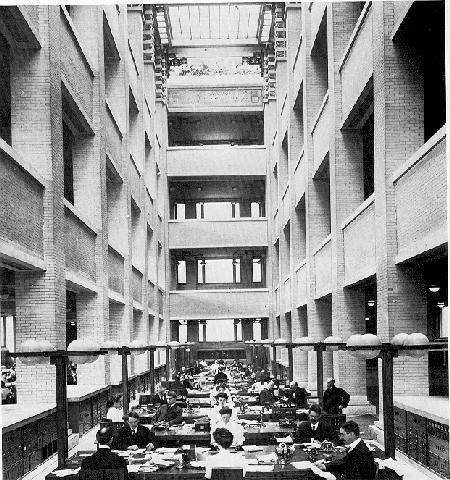 The Larkin Building was designed in 1904 by Frank Lloyd Wright for the Larkin Soap Company of Buffalo, New York, at 680 Seneca Street. 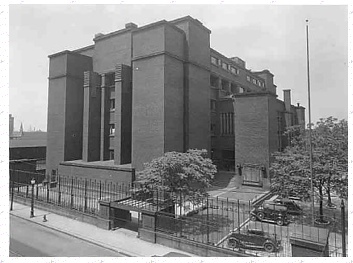 The five story red brick building was noted for many innovations, including air conditioning, stained glass windows, built-in desk furniture, and suspended toilet bowls (hung from the walls, not supported by the floor). Sculptor Richard Bock provided ornamentation for the building. 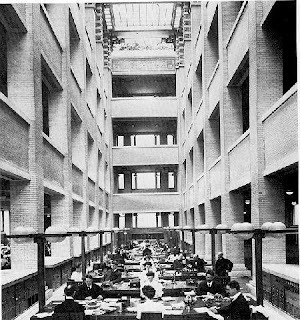 Through Martin, Wright got the job of designing the Larkin Company administration building, the first entirely air-conditioned modern office building on record….It is blocklike and extremely simple in its forms, and has very little ornamentation….the Larkin building was decisively vertical…Indeed, it was the first consciously architectural expression of the kind of American structure which Europeans were beginning to discover to their delight: the great clusters of grain silos and similar industrial monuments that men like Corbu and Gropius found so exciting in the early 1920s…” — Peter Blake. 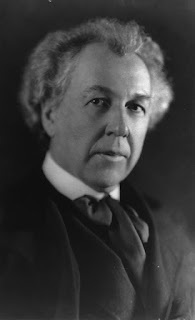 Frank Lloyd Wright: Architecture and Space. 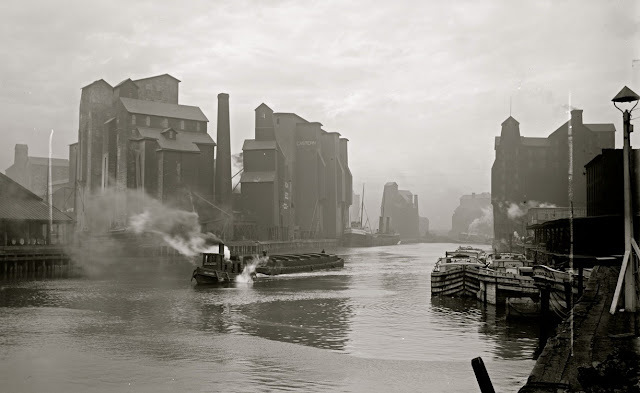 ...The man who has designed hundreds of outstanding buildings, written an autobiography and numerous magazine articles and lectured extensively to young architects in Europe and America, got his first real break in Buffalo. The Larkin Administration Building has profound significance in the history of American Architecture. Erected in 1906, it was the country's first ultra-modern office building, completely reversing the 19th century tendency to lavish ornamentality. It was the country's first air-conditioned office building and was among the first fire-proof structures built. Installed in it, and part of the architects plan, was the first metal furniture made in the United States. Magnesite as architectural material first was employed in it's construction and it boasted the first metal bound plate-glass doors and windows. "Is Still in The Talk Stage"
The Larkin Administration Building, 680 Seneca Street, designed by Frank Lloyd Wright, noted architect, has been sold to L.B. Smith, a Harrisburg contractor. The company made no comment on reports the structure, at one time reputed to be the largest private office building in the world, would be taken over by the Army to house many War Department offices in Buffalo. A. H. Miller, comptroller of L.B. Smith, Inc. who handled the negotiations for Mr. Smith, said there is nothing definite with respect to disposition of the building and that acquisition by the Army "is still in the talk stage." It was from this building, completed in 1906, that the Larkin Company, guided by the principles of it's founder, John D. Larkin, directed its "factory to family" dealings in the heyday of a mail order enterprise that flourished long before other similar concerns. The retail business of the Larkin Store Corporation, which has been carried on in this building for the last five or six years, will be continued at this location. The store corporation has a lease on the building which runs for about nine months., Mr. Miller said. The company also will continue to carry on it's mail order business in household supplies, furniture and soft goods. A national newspaper advertising campaign to sell the Larkin Administration Building, 608 Seneca Street, will be recommended to the Council Finance Committee Tuesday by Comptroller George W. Wannamaker. 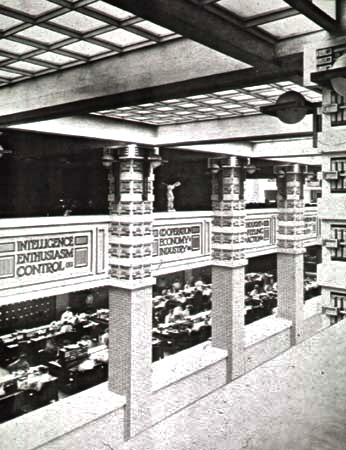 The building was designed by Frank Lloyd Wright, nationally famous architect, and is said to have cost $4,000,000. The city acquired title through tax foreclosure. The building assessed at $240,000, has been vacant several years. Wannamaker said if the Finance Committee approves his plan, advertisements will be placed in the Buffalo Evening News, Wall Street Journal, New York Times, Chicago Journal of Commerce and other publications with a national circulation. "The only offer the city has received for this magnificent building is the sum of $26,000. This is only a small fraction of it's value. 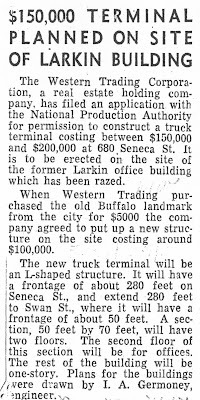 By use of a national newspaper campaign Buffalo may receive much higher bids and possibly attract a new business or industry to this city." The city is back where it started in its efforts to sell it's "white elephant," the old Larkin Company's Administration building at 680 Seneca Street. Late Tuesday, the Common Council's Finance Committee decided to receive and file a $500 offer for a 90 day option to buy the building for $25,000. The offer was submitted several weeks ago by Maurice Yellen, attorney for an undisclosed client. The property has an assessed valuation of $221,810. On the basis of the offer, the committee two weeks ago recommended to the full membership of the council that the property be re-advertised for sale, even though the committee had already spent $6,000 for advertising. The committee, however, specified that the re-advertising include the city's willingness to give the prospective purchasers a 90 day option, a condition which was not included in the previous sales efforts. The council approved the re-advertising, but at last week's meeting, the resolution was recalled from the Mayor and re-committed to the Finance Committee. "The only way to dispose of this property is to sell it at public auction, just as we do with other City owned property," said Councilman-at-Large George J. Evans, Republican majority leader. "Let somebody give us a bonafied offer, with 10% of the offer in cash. That will give us something on which to conduct an auction. We already spent much money advertising it, everybody ought to know by now that we're anxious to sell it." Disposal of the City's White Elephant, the Larkin Company's old administration building at 680 Seneca Street, remains the real-estate puzzle, with no possibility of a solution in sight. The five story brick structure, once the most modern office building in the country, gradually is approaching a state in which it will be entirely useless. Every double-paned window is shattered. The tall iron gate which graced the entrance has toppled from rusty hinges. The iron fence topping a low brick wall went into war time scrap collection. The Larkin building, a headache to the city since it was acquired in tax foreclosure proceedings June 15, 1945, cost $4,000,000 to build and was designed by Frank Lloyd Wright, a nationally famous architect. Offers to purchase it for around $25,000, far less than it's assessed valuation of $239,000, including land, have been turned down. A national advertising campaign that cost $6,000 brought inquiries but no offers. The state rejected a suggestion that the building be converted for emergency housing and the county took no action on a proposal to make it headquarters of the Welfare Department. At long last, the city Tuesday took a step toward getting rid of it's biggest real-estate headache, the 'white elephant' old Larkin Company Administration Building at 680 Seneca Street. The Council Finance Committee approved sale of the building for $5,000 to the Hunt Business Agency, acting for an undisclosed client. The agency has agreed to demolish the existing building and replace it with a taxable improvement costing not less than $100,000 within 18 months. Just what use the premises, which have an assessed valuation of $128,960, will be put to, has not been disclosed, however. The committee's action now goes to the full Council, which is expected to approve it Tuesday, although Councilman-at-Large George J. Young, Republican, said he was against selling the property for "only $5,000," when he claimed, "it would be used more advantageously for a playground." 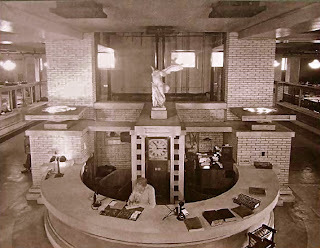 Originally the Larkin building was the most modern office structure in the U.S. It has been a municipal headache since the city acquired it for nonpayment of taxes in 1945. It originally cost around $4,000,000. The city has spent more than $6,000 in advertising for prospective purchasers. The Larkin office building in Seneca Street, once the princely throne of a business dynasty that sold soap and household products in 48 states, has come to the end of it's usefulness. It's steel girders will be used to shore up coal mines in West Virginia; it's brick and concrete debris will help fill the Ohio Basin (now Father Conway Park on Louisiana St.). Wreckers who took the job on tearing down the 44 year old building got more than they bargained for. It was built to stand forever. The floors of the seven-story structure are made of giant re-inforced concrete slabs, 10 inches thick, 17 feet wide, and 34 feet long. they are so heavy that when they are cut into sections to be removed, they are apt to crash to the floor below. Structurally, the building is hardly without parallel. The floors are in tiers, around a deep well, and are supported by 24 inch steel girders, much larger in size than are generally used today. The wrecking contractors, Morris & Reimann, say the building designed by noted architect Frank Lloyd Wright, would cost $7,000,000 to $10,000,000 to duplicate at present prices. It was purchased from the city for $5,000 by the Western Trading Corporation, on the condition it would raze the building and erect a new structure to cost around $100,000. The new building planned would be a motor freight terminal. The depredations that took place when the Larkin office building stood idle, while in the hands of the city, were not a pretty picture. 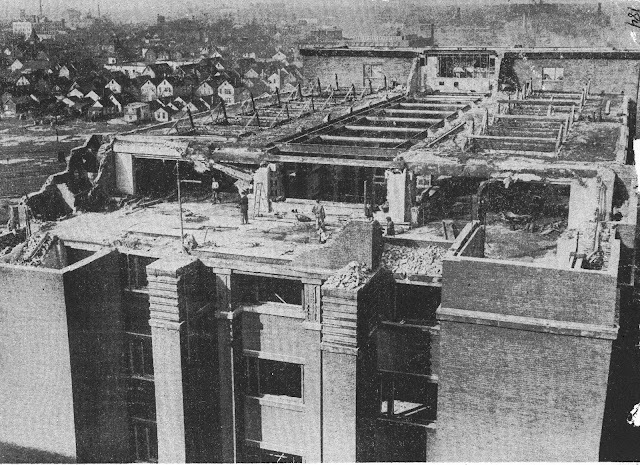 Nearly every window had been broken, and thieves stripped the building of about 20 tons of copper, including the copper roof. 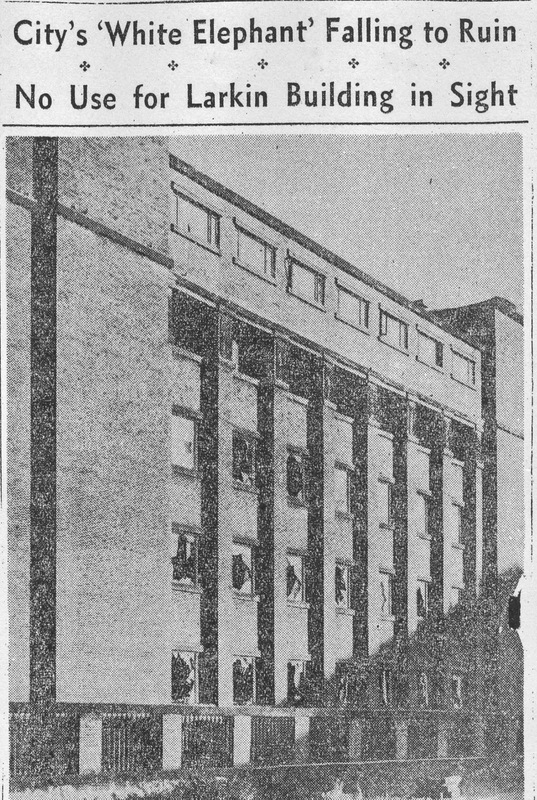 When the Larkin clubs were popular, money from the customers poured into the Larkin building in such volume that it had to be tossed into baskets and barrels. 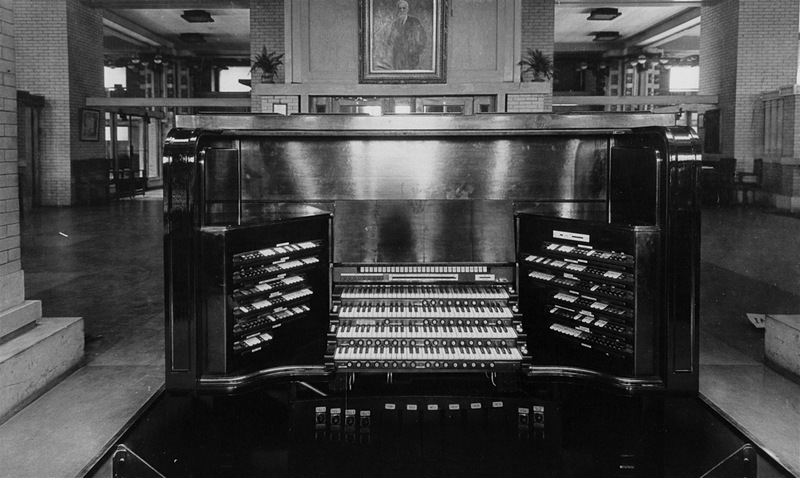 The Larkin office staff performed its tasks while soft music was played on a famous pipe organ. View below looking north shows how the razing of the Larkin building on Seneca Street near Swan, is progressing. The building designed by Frank Llyod Wright and constructed in 1906 at a cost exceeding $6,000,000, is making way for a new building. The city sold the structure in November 1949 to the Western Trading Corporation for $5,000. Famous Larkin Building Being Razed Under Sale Agreement Between City & Purchaser. In the end, the Larkin Building was sold for $5,000, a fraction of the cost of earlier offers of $25,000 or more, which were refused! 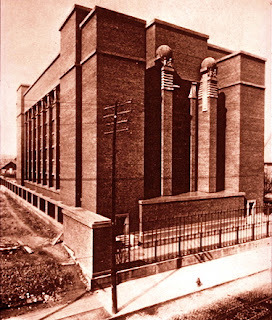 And as the last article relates, the promised structure which was to replace the Larkin, was never built on the site. The end result was the city lost $1,000 on the deal and wound up with a PARKING LOT! As most people in the Buffalo area know, this is a scenario which has repeated itself many times over the past six decades. Buffalo is now graced with many 'historically significant' parking lots that tourists from around the world flock here to see! 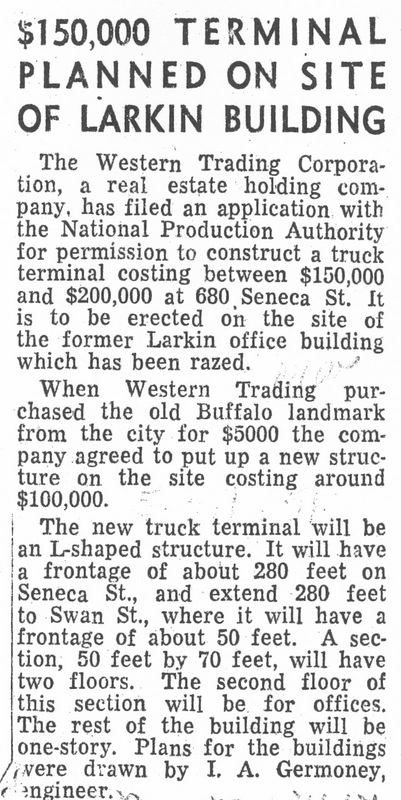 Most of the Larkin Building itself never left Buffalo. Much of it is now located under Father Conway Park, the old Ohio Basin on Louisiana St., in the Old First Ward. This story is basically the 'rite of passage' most historically or architecturally significant buildings go through in Buffalo. Sometimes the outcome is good, sometimes not, just a roll of the dice, some arguments, lawsuits and if it's lucky it survives. Cultural Tourism is the Buzz Word around WNY this month. But in reality City Hall fights it on a daily basis although it won't admit it. Hopefully, when the National Conference on Historic Preservation leaves here later this month (Oct. 2011), many of the Common Council members and other local representatives will have actually attended the workshops, lectures and tours, and not just use them as photo-ops. They need more than just a photograph taken, they need an education on the advantages and opportunities historic preservation provides for the region. It is Buffalo who needs to learn something from this convention, and start on a new course of understanding of it's heritage and what it means to this city and take advantage of the opportunities it presents for the future. Making beautiful buildings into a parking lot for "urban renewal" is almost always the worst answer. Edith Wilson's idea has done a lot to hurt America. Great article about the Larkin building. Sad though. Imagine that it was still standing and used as a museum or tourist attraction. It probably would have stood for 300 years. One question - The grand organ was included in the sale, I understand that, but what eventually became of it? Please don't tell me that it was destroyed with the building! I found information on the organ at the following link. There is a photo of it there also. It was not destroyed but not kept intact either. Read the details at the link below.